The town developed around the Undead Parish became home to the many humans in Lordran. Sadly it was reduced to ruins after the onset of the Undead curse arrived. There are two main areas; Upper Undead Burg and Lower Undead Burg. The upper Burg seems to have once been the nicer part of town, but now shows marks of revolts, urban fights and death, while is also home to a drake and the Taurus Demon. The tight corridors of the lower Burg have not improved with time; it has been a refuge for thieves and other criminals before and now the Capra Demon has taken up residence. 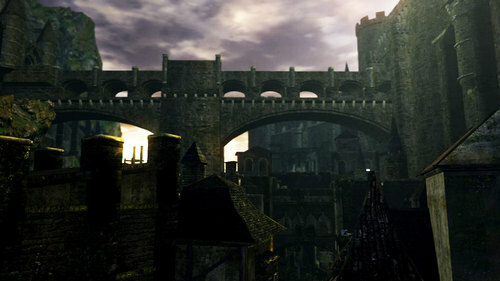 Prior to the outbreak of the curse it may have been a pilgrim's resting place on their way to Anor Londo before the entrance to the City of the Gods was walled up. There are a couple of nearly hollow Undead acting as merchants in the Undead Burg, who will give the Chosen Undead items and weapons in exchange for souls. They illustrate the degradation of the mind that occurs as the Undead grow close to being hollow. Havel the Rock was supposedly locked away in a watchtower here, presumably by Gwyn, where he eventually went Hollow. He's in the basement of the watchtower before the fight against the Taurus Demon. Here, the Chosen Undead would find this once mighty hero, brought low by forces greater than himself. The Taurus Demon guards the bridge to the Undead Parish, and the Capra Demon guards the entrance to The Depths and ultimately, Blighttown. Solaire is first met here, just after the defeat of the Taurus Demon. Griggs of Vinheim can also be found in the Burg, locked in a room in the lower area. After speaking to him, he will return to Firelink Shrine. Some theories point the Undead Burg to be the ruined kingdom of Balder, as the actual name of the area could just be unknown in the present. The main point of this theory is that, after being their kingdom ruined by an outbreak of the curse, several Balder knights, led by the great Knight King Rendal, set up defenses in the Parish, while Rendal and other knights went to Sen's Fortress. 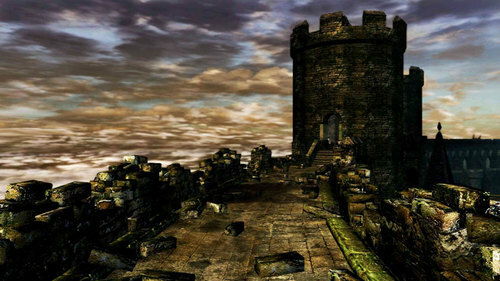 It appears that Rendal perished, as his ring is found in the area but in Dark Anor Londo, a Balder knight is seen in the main hall, showing that the initial mission of the Balder knights might have been to reach the City of the Gods, as the Crestfallen Merchant implies in Sen's Fortress. The basement of the watchtower forms a stone cell. There are rumors of a hero turned Hollow who was locked away by a dear friend.